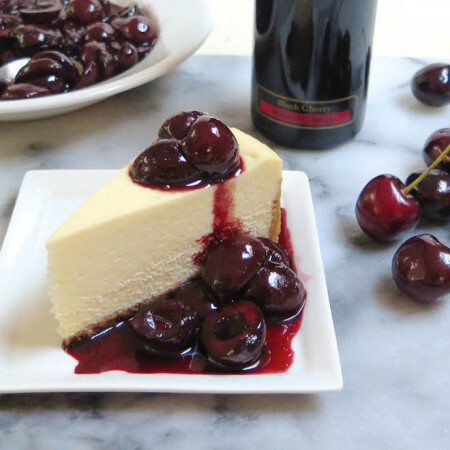 Our dense and creamy vanilla cheesecake recipe makes a large cheesecake that is yummy all by itself but it is also really delicious topped with fruit, like our Balsamic Glazed Cherries. Not too sweet, it makes a good base for many other variations like soursop, passionfruit or a family favorite: calamondin. The key to our dense and creamy texture is baking it in a water bath. 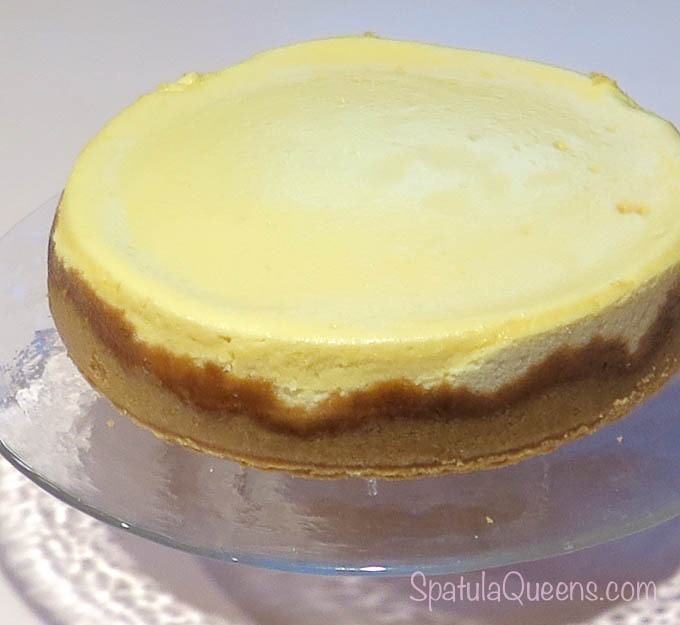 This keeps the baking even and keeps the humidity in the oven high, so the cheesecake doesn’t lose a lot of moisture during the hour and 45 minutes it is in the oven. I also believe using the paddle attachment instead of the whisk attachment keeps from incorporating too much air into the batter. Note: the baking time for this recipe is based on a 9-inch diameter pan which yields a nice, thick cheesecake. 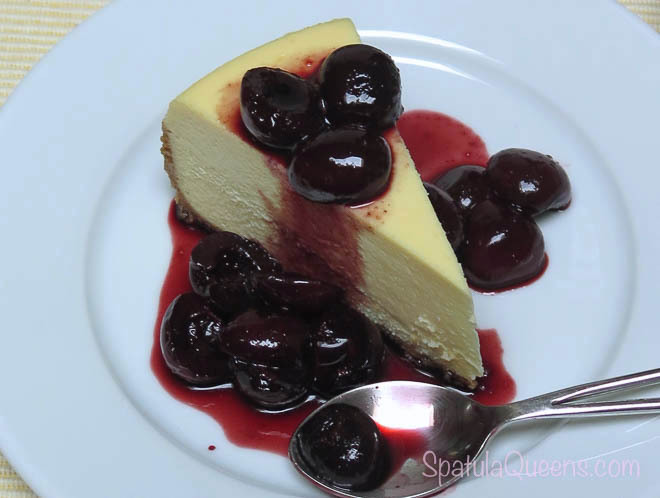 If you use a 10-inch pan, you may need to reduce the baking time a little to avoid over baking the thinner cheesecake. We aren’t too picky about the contents of the crust – to me crust is just the means to keep the batter from running out of the springform pan. If you are one of those people who loves your crust, then we have options for you: our recipe below has three choices – use graham crumbs, leftover shortbread cookies or store bought sandwich cookies – whatever is at hand. Process the cookies to a fairly fine crumb and press them firmly and evenly into the bottom and up the sides of a 9-inch springform pan, going about an inch up the sides. Preheat the oven to 325 degrees and bake the crust for 5 to 7 minutes. Remove from oven and cool on a rack. Place a large roasting pan in the oven and add enough hot tap water to fill the pan with at least an inch of water. Leave this water-filled roasting pan in the oven to heat up while you are mixing the cheesecake batter. Place the white sugar and room temperature cream cheese into a mixing bowl and beat on medium with paddle attachment until smooth. 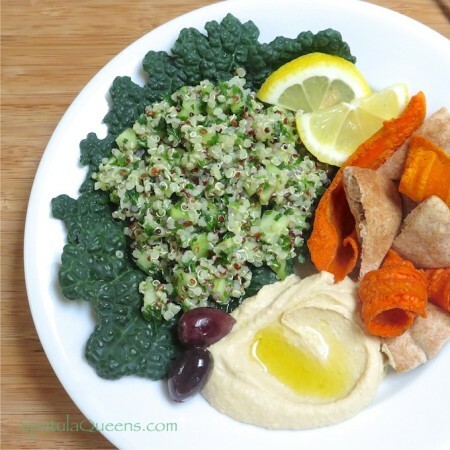 Stop and scrape the side of the bowl frequently. 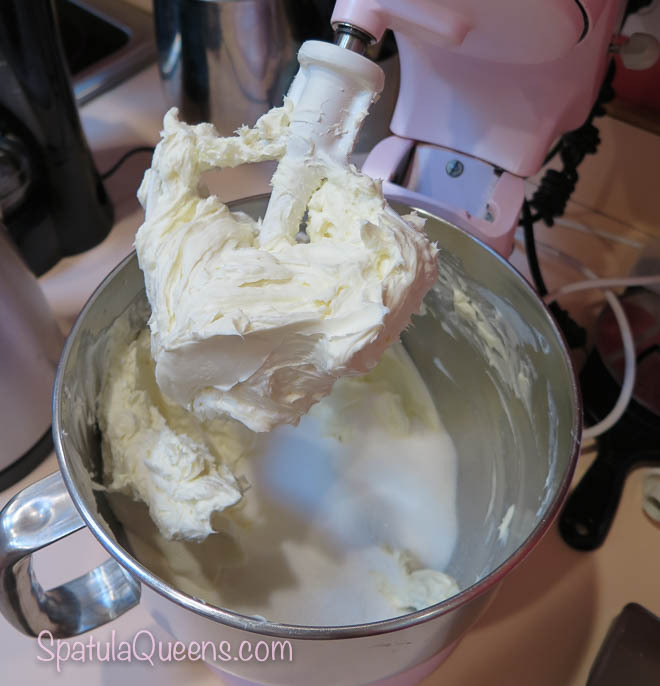 Beating the sugar with the stiff cream cheese helps smooth out the cream cheese more quickly. In a small bowl, beat the eggs and egg yolks lightly with a fork. Add about 1/4 of the eggs at a time, scraping the side of the bowl and mixing until each portion is incorporated. Add the vanilla extract and beat until incorporated. Make the springform pan waterproof by placing the pan of crust over a large square of heavy duty foil and wrapping tightly up the sides. Repeat with second square of foil. This second piece of foil is “insurance” against accidentally piercing the foil seal. Working over a soft kitchen towel will protect the foil. Pour the batter into the pan and place the pan carefully into the water bath in the oven. Bake for an hour and fifteen minutes then turn the oven off and leave the cheesecake in for another 30 minutes without opening the oven door. Some people like the crack across the top of the cheesecake that can occur as the cheesecake cools and shrinks. We do not, so as soon as the cheesecake is removed from the oven, we run a thin knife around the edge to loosen it from the edges of the pan. That, plus having baked it in the high humidity of the water bath results in the nice smooth top. Remove the pan from the water bath. 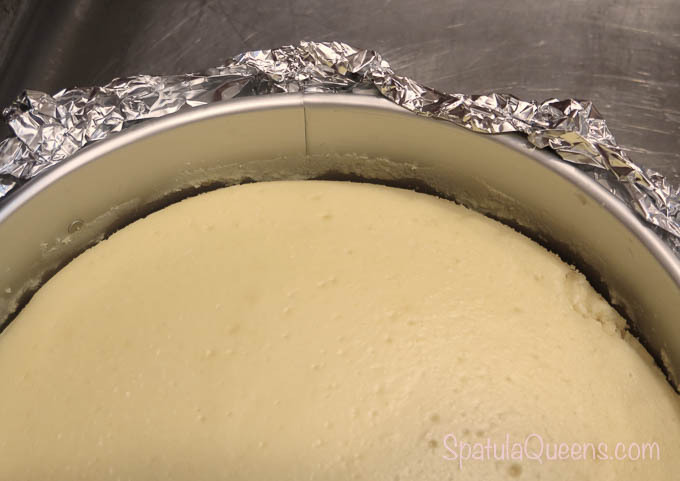 Remove the foil and cool the cheesecake on a rack until cool enough to place into the refrigerator. Chill for at least 4 hours before serving. After it is chilled, place it into the freezer for about 30 minutes before attempting to remove it from the springform pan. 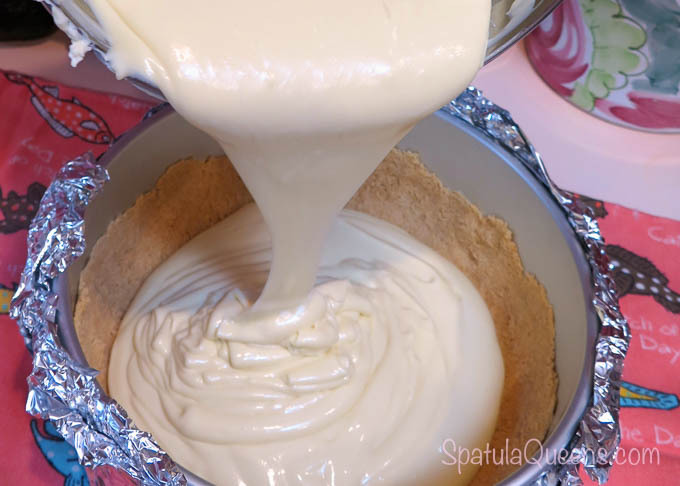 Use an offset spatula or cake server to release the cheesecake from the bottom of the springform pan then slide it onto the serving platter. The baked cheesecake can also be wrapped in two layers of plastic wrap and a layer of foil and frozen for up to a month. 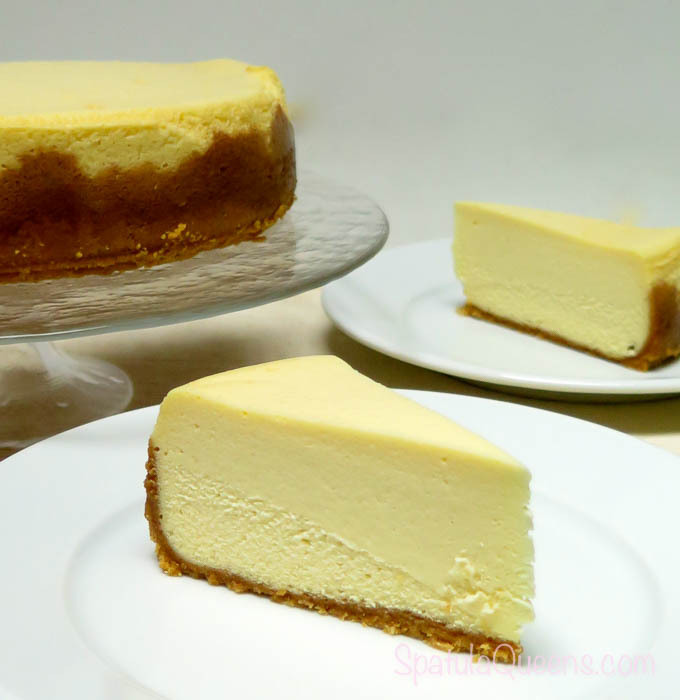 A soft (unfrozen) cheesecake can be damaged when being wrapped tightly. 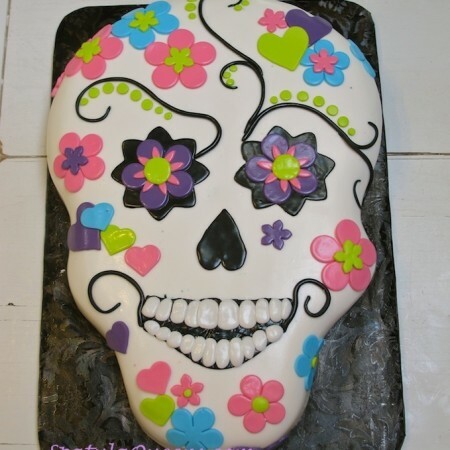 The best way to prevent this is to freeze it for a couple of hours before wrapping it. To serve, allow it to defrost in the refrigerator for about 12 hours. Serve plain or with your favorite topping. The key to our dense and creamy cheesecake texture is baking it in a water bath. 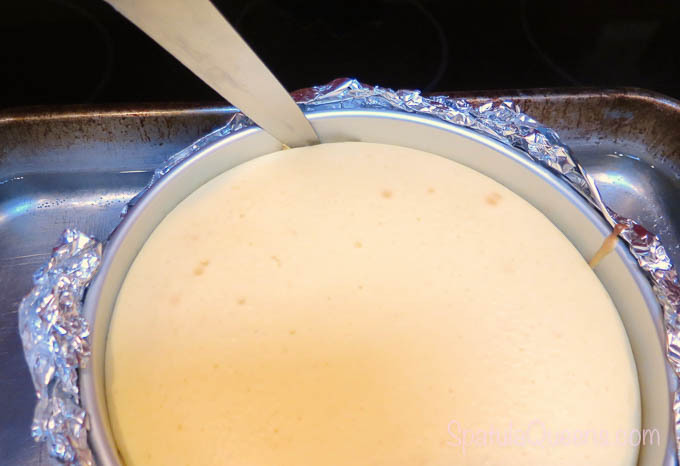 This keeps the baking even and keeps the humidity in the oven high, so the cheesecake doesn’t lose a lot of moisture during the hour and 45 minutes it is in the oven. 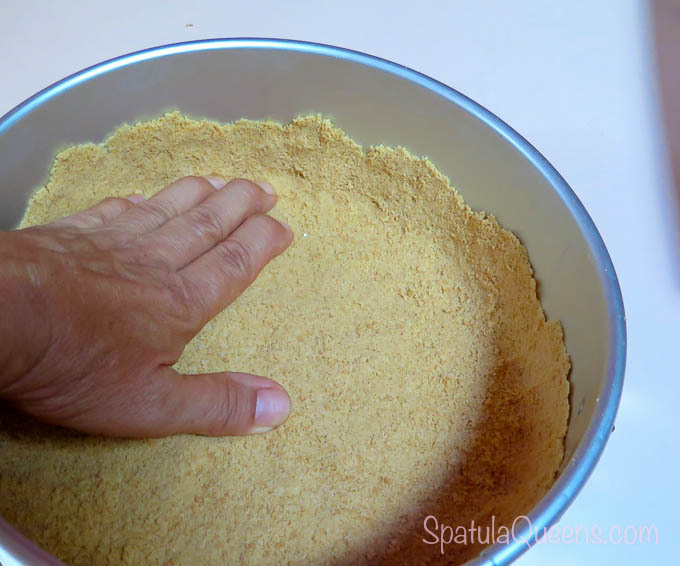 This recipe baking time is for a 9-inch springform pan, which yields a fairly tall cheesecake. If you use a larger diameter pan, your baking time may need to be reduced slightly. Option 1. 10 ounces sandwich cookies processed to fine crumbs in food processor. Firmly press crust mixture into bottom and up the sides (half to one inch up the sides) of a springform pan. Cool on rack. Leave oven on. Place a large roasting pan (large enough to hold the cheesecake pan) in oven and fill with at least an inch of hot water. In mixer, beat cream cheese and sugar until smooth, stopping mixer to scrape the sides of bowl frequently. 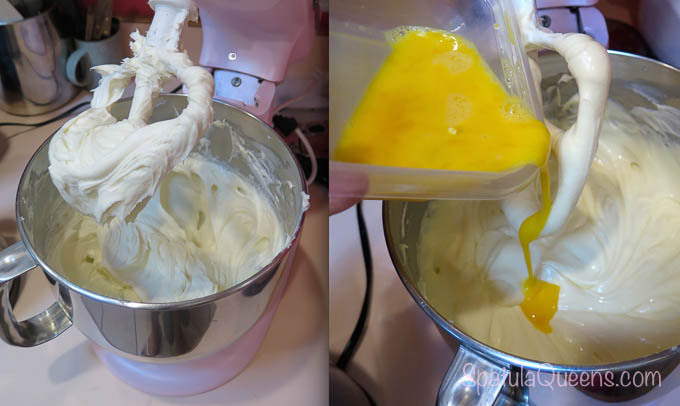 In a small bowl, lightly whisk the eggs and egg yolks together. Add the mixture, about ¼ at a time, mixing until smooth after each addition. 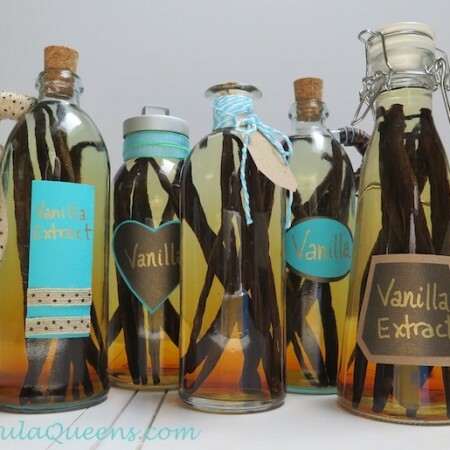 Add vanilla extract and mix until completely incorporated. Place cooled crust in pan over a large square of heavy duty foil and wrap tightly up the sides. Repeat with second square of foil. The purpose is to make the springform pan waterproof. Gently pour the cheesecake batter into the prepared crust. Gently and carefully place the cheesecake into the water bath in the oven. Bake at 325 degrees for one hour and fifteen minutes. Turn the oven off but leave the cheesecake in the oven for an additional 30 minutes. Remove from oven, carefully lift from the hot water, remove the foil and set on rack until cool enough to refrigerate.